Most of my recipes (by necessity) are fairly quick, just like my blog posts. I don’t have a lot of time, so I’m guessing you don’t either. There are times in life, though, when you have the need, or just the time, to make a fancier dish that requires just a bit more time. 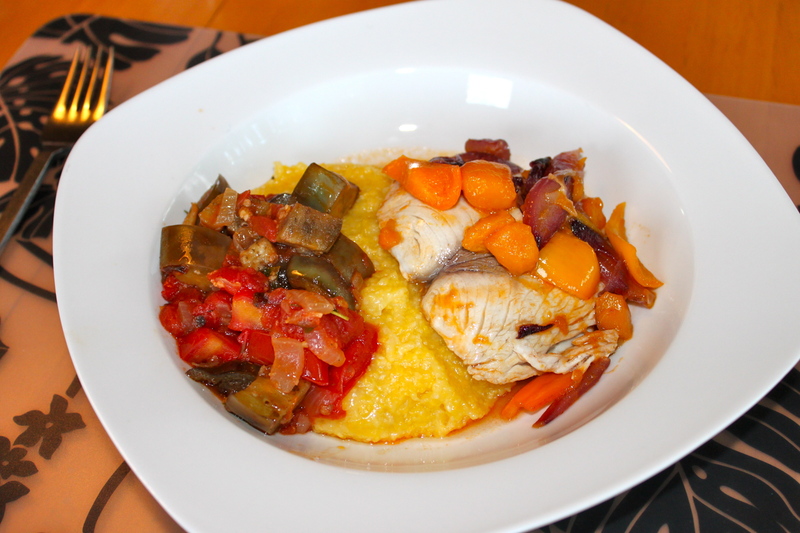 We had some mahi-mahi that needed to be eaten, again, and I felt like cooking it up with some polenta, I also had some mangos and eggplants, and while that seems like a very odd combination, I found a couple recipes that I was able to meld and it turned out amazing! In a large saucepan with a cover, cook the onion and peppers in the oil until soft. Add the mango and cook another minute. Sprinkle with 1/2 tsp salt. In a bowl, combine 1/2 tsp salt, ketchup, sriracha, soy sauce, worcestershire, sugar, mirin and water to make a sauce. Stir, then pour over the onion mixture. Bring up to just a boil. Sprinkle the mahi with a pinch of salt, then place over the onions and sauce mixture. Spoon some of the liquid over the fish filets, then place cover over the pan and cook until the mahi is white throughout, probably 8-10 minutes depending on the thickness of the filets. You can put this fish over anything, the original recipe was for soba noodles, but it would also be great over rice. For this meal, it was placed on one side of the polenta with the veggies on the other side, and it was absolutely delicious! Served in a pasta bowl, this fresh, Maui-caught Mahi-Mahi, with a mango topping, was delicious over polenta, with a side of mixed vegetables.